Also known as Saccha Badshah (emperor), Guru Hargobind Rai was the sixth guru of Sikhs. Born on June 19 1595 (now July 5) at Guru ki Wadali, Amritsar, he became guru on May 25 1606 following his father Guru Arjan Dev’s teachings. He was 11 years old when his father was executed by Mughal authorities during Jahangir’s reign. Guru Hargobind was also the inventor of Taus, a musical instrument which was similar to the sound of music. He was a brilliant martial artist and avid hunter. He also founded the city of Kiratpur Sahib which falls in the district Rupnagar. After Guru Arjan Dev’s martyrdom, Guru Hargobind Rai completely transformed Sikhs from just spiritual beings to ferocious warriors. He encouraged people to maintain physical fitness and keep themselves ready for physical combat. He also built a fortress at Amritsar called Lohgarh (fortress of iron). He wore two swords of Miri and Piri. Miri dignified temporal authority and Piri, spiritual authority. The same philosophy was applied in the foundation of Akal Takht, the highest temporal seat of Sikhs. He constructed Akal Takht in front of Harmandir Sahib in 1606. Initially a platform, Akal Takht was about twelve feet, a complete defiance of Mughal rule that none apart from Mughal emperor could sit on an elevated platform above three feet. It is worth mentioning that Akal Takht’s platform was a fraction below Darbar Sahib signifying that spirituality was always primary in Sikhism. Akal Takht marked the beginning of Sikh militarization, Guru Hargobind added lustre to Sikhism, he added marks of sovereignty to the symbols of sainthood, including umbrella (chhatar) and kalgi. He administered justice like a king and awarded; honours and punishment as well. As per Cunningham, "The genial disposition of the martial apostle led him to rejoice in the companionship of a camp, in the dangers of war, and in the excitements of the chase". During the guruship of Hargobind, Sikhs had formed a separate and independent identity which had nothing to do with the contemporary Mughal government. Despite giving attention to militarisartion, Guru Hargobind did not neglect preaching and spreading of Sikh religion. He sent Sikhs to far of places to preach Sikhism. 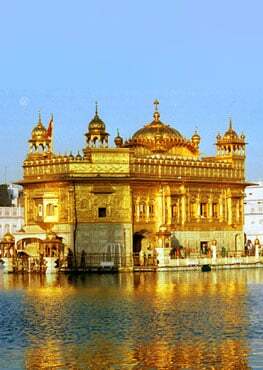 Guru was an excellent statesman and his darbar was known for its splendor. During his time, martial training was imparted to the Sikhs,the Guru had Risaldari (army) of three hundred horsemen and sixty gunners in course of time. He had a stable of eight hundred horses. Jahangir was not tolerable towards Sikhs as his father Akbar was. He could not tolerate the armed policy of Guru Hargobind and consequently imprisoned him in the fort of Gwalior for almost one year where the Guru had gone himself willingly in order to relieve Jahangir from his illness. Sain Mian Mir interefered and asked Jahangor to release the guru as his illness was long over. But the guru refused to leave the fort without other 52 princes who had been confied for long. Ultimately, the Mughals had to relent and all the princes were released. The occasion is celebrated as Bandi Chhorh (liberator) divas in the Sikh history, on the same day as Diwali. After Jahangir’s death, relations again turned bitter with the Mughal emperor Shahjahan. During his lifetime, the Guru fought four battles. In all the battles, Sikhs were victorious. On the third day of March 1644, (Bikrami 1701), Guru Hargobind called his followers and passed on the gurgaddi to his son Guru Har Rai. The very same evening Guru breathed his last. A city Hargobindpur has also been named after him which he had won after defeating the Mughals. Guru Hargobind has always occupied a special position as he was the one who transformed Sikh fraternity by introducing martial arts and weapons and strengthened the principle of Miri and Piri.